With the winter holidays right around the corner, we’re carefully putting together lists of gifts for every person in your life. The holidays are the perfect time to kick back and relax with a glass of wine, a specialty cocktail, or a craft brew. But gifting booze can be difficult, particularly if your intended recipient is finicky about their drinks. If you’re having trouble shopping for the bar aficionado in your life, check out our guide to gifting liquid courage. Buying whisky for an enthusiast is damn near impossible. So skip the whole ordeal of picking out the wrong bottle at the liquor store, and go for a whisky ice wedge instead. It’ll keep the brown stuff cold, without diluting it, and it’ll keep your whisky enthusiast happy, without depleting your bank account. The Whisky Wedge is available through MoMA’s online store, and retails for $18. If your gift recipient likes to crack open a cold one at the end of the day, consider gifting them this Deco Brass Bottle Opener. Crafted out of solid brass and molded in an art-deco design, this handsome bottle opener is a welcome addition to any mid-century bar cart. The Deco Brass Bottle Opener is available through Leif Shop, and retails for $45. Handcrafted with walnut wood and brushed brass, this handsome bar cart from Chris Earl makes for a decadent holiday gift that will last from the mid century to the next century. With two tempered glass shelves, this bar cart can hold a full shelf of booze and glassware. 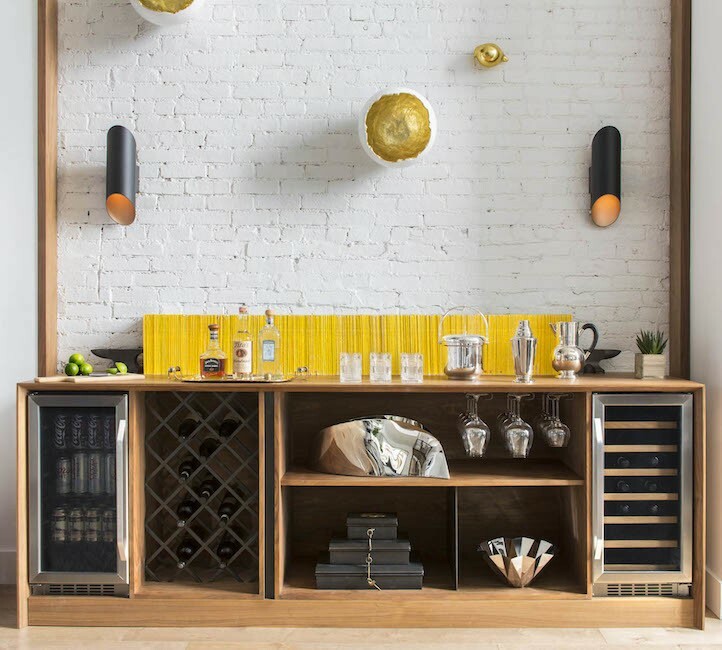 The Walnut Bar Cart can be purchased through TRNK, and retails for $1650. Ideal for frequent travelers, or for those who like their drinks to-go, the compact Carry-On Cocktail Kit makes for a great stocking stuffer. It doesn’t come with any actual booze, but gives you all the ingredients to make two drinks while you’re at 30,000 feet. We’re a fan of the Old Fashioned mix, but they also offer mixes for making Moscow Mules, Bloody Marys, and a host of other drinks. The Carry-On Cocktail Kit is available through W&P Design, and retails for $24. Whether your special someone likes their whisky mixed, straight up, or on the rocks, the Denver and Liely Whisky glass is the perfect gift for the whisky drinker in your life. Hand-blown glass gives this handsome piece an individualized touch, and the contoured shape is perfect for opening up a glass of the good stuff. These whisky glasses can be purchased from Denver & Liely, and retail for $50. If you’re going to be taking some liquid courage to go, at least stash it in a sleek flask. The Liquid Body Flask is hydro-formed with two sheets of stainless steel, which gives each flask a slightly unique shape. The Liquid Body Flask is available through AreaWare, and retails for $60. From an innovator in the world of craft cocktails, this recipe book from Jim Meehan, the founder of PDT, a local New York Cityfavorite, is a wonderful gift for the craft cocktail lover in your life. With over three-hundred recipes, hopefully it’ll keep them busy for a while. The PDT cocktail guide is available from Amazon, and retails for $16.